Viber, which lets iPhone users call and send messages to contacts over 3G and WiFi, free of charge, has been teasing its Android app for a while now. Last May, the VoIP startup finally released an Android app in beta, but only to a limited subset of some 50,000 users. Today, they’re officially launching the application for all. 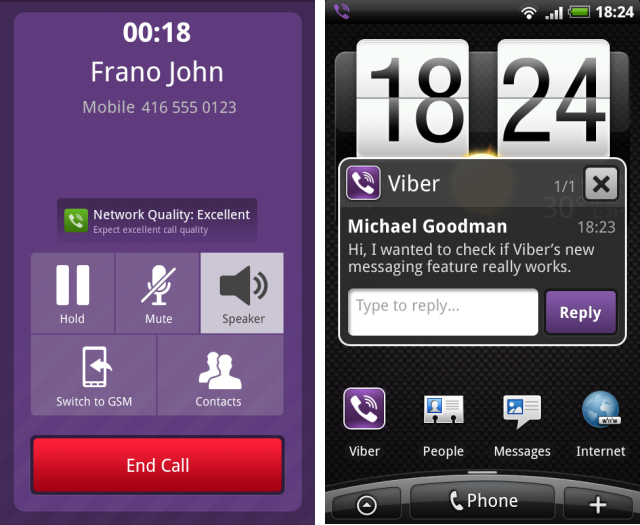 The app includes several features exclusives to the Android version, such as a full call screen whenever a Viber call is received, pop-up text message notifications and a default dialer setting that enables users to use the Viber dialer for all their phone calls. Viber also announced that it has acquired over 12 million active users (last 30 days, out of 20 million registered users) and has a call traffic volume of over one billion minutes of calls per quarter. On average, the company says, active users talk on Viber for 11 million minutes per day, with an average of 6 minutes per call.